LaShawn Jameison, 22, could spend nearly two years in prison if convicted in connection with a shooting earlier this year. LaShawn Jameison got his first tattoo when he was 15. On the inside of his right forearm, in scrawling black ink, is his mother's name: Shawnta. He figured she couldn't whoop him too bad if the tattoo was in her honor, but he also wanted to pay tribute to the woman raising him alone. When LaShawn was 11, his father was shot and killed over a couple of ounces of weed, a robbery gone wrong, according to court documents. Jameison, now 22, recalls being in court the day the 19-year-old who pulled the trigger was sentenced. He remembers the man's yellow eyes. 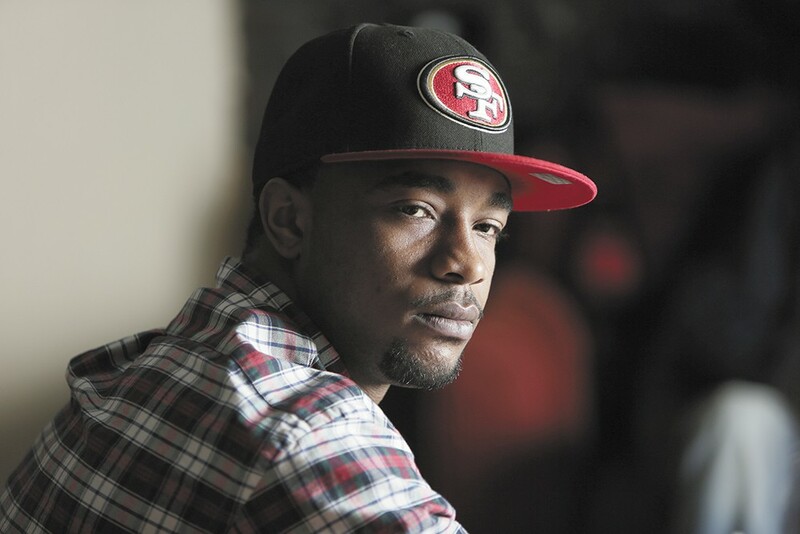 As a kid growing up in Stockton, California, gun violence was too common. He recalls that by the time he finally left home for school at Southern Oregon University, where he played football before transferring to Eastern Washington University, at least 10 of his close friends were dead, mostly from gunfire. "I grew up in an environment where people don't go to college, no matter how academically or athletically gifted they are," he says. "I was lucky to have both of those. Otherwise, I probably wouldn't have made it out. I got out of Stockton just off the strength of not wanting to lose my life, like my buddies." Earlier this year, Jameison and two other men — Kwame Bates and Anthony Williams — were charged with first-degree murder and 14 counts of drive-by shooting stemming from a shootout near the Palomino Club in north Spokane. All but two counts of drive-by shooting against Jameison have been dismissed. He was released from jail in June, but not before he watched his football career, and possibly his education, crumble around him. He's still awaiting trial on the drive-by charges, a free man for now. The possibility of more charges looms large. His case further spotlights the role of video evidence in criminal cases, and raises new questions about gun violence and a citizen's right to defend himself. For Jameison's attorney, Josh Maurer, the case also emphasizes a prosecutor's responsibility to seek justice, not convictions. Maurer says Spokane County prosecutors twisted the facts to justify adding murder charges in the first place. Spokane County Deputy Prosecutor Stefanie Collins declined requests for comment, citing the pending charges. "What bothers me is that in the face of a video that unequivocally shows what happened, the state has lied about the facts," Maurer says. "It's concerning to me that this type of behavior is allowed to occur in our system of justice. The principle of 'innocent until proven guilty' is vitiated when this type of conduct is condoned." Dressed in yellow jail scrubs, his pants tucked into his orange socks, Jameison sits next to his attorney during a bond hearing last month. Spokane Superior Court Judge Michael P. Price had released one of Jameison's co-defendants, also charged with murder, a week earlier. On this day, Price has to get something off his chest. "This is just my personal mindset, and it doesn't really matter, but for what it's worth: regardless of whether this is a no-duty-to-retreat state or not, it seems to me that in 2016 in the United States of America that we have people walking around with handguns, shooting at each other over who knows what — that's completely nonsensical," Price says from the bench. "Citizens carrying around handguns with absolute freedom like it's the Wild West. It's a complete scourge on our society. You ask yourself this question: how many of us want to go to a party — what's supposed to be a joyous event — if we knew there were a bunch of people walking around carrying handguns?" Price denied Jameison's release that day. Weeks later, Jameison appeared in front of Price again to ask him to dismiss the charges. Price again expressed disdain for gun violence, but acknowledged that Jameison's case presents a complicated question. "Is it OK when you are arguing self-defense, to start firing back at someone who is shooting at you?" Price asks rhetorically. "That's obviously very fact-dependent. For example, as Mr. Williams is firing on Mr. Jameison, does Mr. Jameison have to just sit there, crouching behind a car while Mr. Williams walks up and executes him? At what point is it OK to fire back?" Ultimately, Price ruled that although Jameison's actions were reckless and unreasonable when he fired in an area full of innocent people, he could not be held responsible for the death of an innocent bystander. Citing the video evidence, Price dismissed the murder charge but allowed two counts of drive-by shooting to stand — one for each shot Jameison allegedly fired (his attorney says he only fired once, and in self-defense). At that point, Price released Jameison pending trial. It was early on the morning of Jan. 18, 2016. Jameison just left the Palomino Club with some buddies. The crew spent the night partying in a VIP booth, drinking champagne, he says. They were celebrating Martin Luther King Jr. Day. The club closed, and a confrontation between at least one of Jameison's friends and another man spilled out into the parking lot. That friend, Kwame Bates, later told police that he confronted a man named Anthony Williams for pushing a woman. As tensions escalated, Williams left to get a handgun, according to police records. Video surveillance footage shows Bates and Jameison doing the same. Williams and Bates continued to chirp at each other. Jameison, who says he could sense what was about to happen, backed away and crouched behind the nearby Chrysler 300. Bates was his ride home to Cheney. A group of innocent bystanders hid behind Jameison on Lidgerwood Street outside the Palomino, according to the footage. Williams fired first, missing Bates but striking one of the bystanders in the head. Bates returned multiple shots. Jameison fired once — in the direction opposite the victim, video shows — but did not hit anyone. In a matter of eight seconds, at least seven shots rang out in total. One man lay dead in the street, and a fleeing red Mustang ran over him. That man was Eduardo Villagomez. Like Jameison, he was a student at EWU, though the two didn't know each other. The junior from Wenatchee had turned 21 just three days before. In the following week, Bates went to the police when he learned of Villagomez's death. Jameison and Williams were then arrested for their roles in the incident, and all three men were charged with multiple counts of drive-by shooting and first-degree murder. 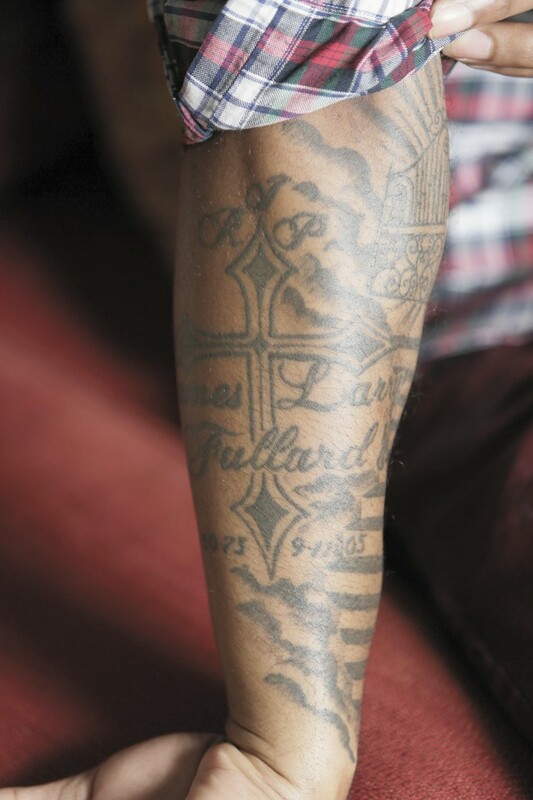 LaShawn Jameison’s right forearm is covered in tattoos honoring his family. The cross is in memory of his father, who was killed when he was 11. Since Josh Maurer took this case in February, something else has been bothering him. He points to data collected at part of the MacArthur Foundation's Safety and Justice Challenge, which revealed racial disparities in Spokane County's criminal justice system. In 2014, for example, African Americans made up 11 percent of the jail's population, despite representing about 2 percent of the county's population. And while the average length of stay in the Spokane County Jail was 17 days for white people, black people spent an average of 25 days — the highest among all races or ethnicities recorded. "He has lost his scholarship for a murder the state knew he didn't commit," Maurer writes in an email. "This is how disenfranchisement happens. What hope is there when the people who are charged with protecting us, and for applying the law fairly and with equity, are the people telling lies?" For his part, Jameison says this experience has changed him. It's skewed his perspective of the court system and thrown his life into limbo. He fears that he's squandered his opportunity to earn a college degree. A former economics major, Jameison made EWU's Dean's List with at least a 3.5 grade-point average. He hoped to get a job as an actuary. Other than the pending charges in Spokane County, Jameison's criminal history is clean, according to Washington and California court records. Before this year, his closest brush with the law was when he got in a fight at the mall. His mom had to come pick him up from juvie. He was 16. Jameison struggles, at times, to reconcile his actions that night in January. He knows his background in a rough neighborhood is not an excuse, but as he waits for trial, he grapples with how to balance the familiar devastation from gun violence and his right to defend himself. The biggest takeaway, Jameison says, is the tragedy in all this: the death of Eduardo Villagomez.